The fifth running of the bulls of this year’s Sanfermin fiestas, with bulls from the Seville bull-ranch of Dolores Aguirre, traditional visitors to the fiestas of Sanfermin. The course was jam-packed with runners – as is usually the case at weekends in Sanfermin – and in spite of the tragedy that occurred yesterday. It was a pretty fast clean running in a time of 2min 52sec. and five runners were removed to the two Pamplona public hospitals, but none of them with serious injuries. The moments of greatest danger featured a loose bull – just as happened yesterday – and this animal ran most of the course alone (from the end of the Santo Domingo stretch) In the stretch leading down into the bullring, the bull charged against a runner on the left side of the fence who had mindlessly tried to catch the attention of the bull. 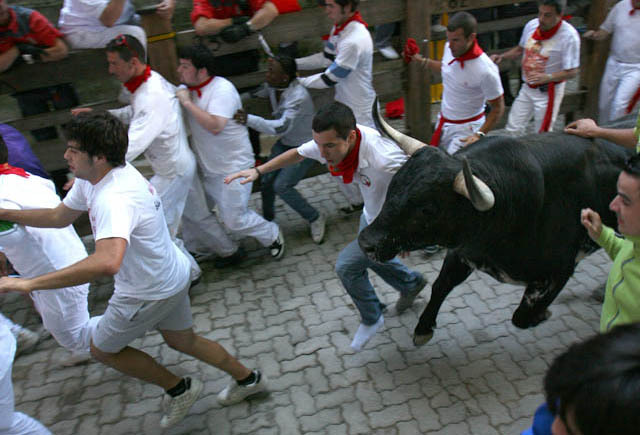 The bull knocked the runner to the ground and tossed him around on the ground without goring him with its horns and when it got distracted by other runners, it continued to run ahead. The first stretch in Santo Domingo was covered very fast and cleanly. The pack was tightly grouped together and, although the runners tripped up and fell on both sides, the bell-oxen were tightly grouped around the bulls and all the animals ran straight ahead without causing danger and the bulls acted nobly and did not make any charges against the runners. Just at the end of the Santo Domingo stretch one of the dappled black bulls fell behind and it was this bull that created the most danger and tension but luckily, without goring any of the runners. The rest of the pack continued to run close together across the City Hall stretch and, although some runners continued to fall, the bulls made no attempt to charge them. The five bulls all crashed lightly against the fencing at the Mercaderes bend and the straggler- bull coming behind slipped up here but it got quickly to its feet and continued to run head. In Estafeta Street the pack began to stretch out somewhat and a black bull was now in front leading the rest of the animals, with four bell-oxen just behind and the other four bulls behind them. The bull taking up the rear continued to run alone and here, the runners managed to get in close to the horns to do some fine running despite the packed number of runners in the Estafeta stretch. On the stretch leading down into the bullring, there were some moments of tension and anguish when a runner standing on the left side of the stretch, mindlessly went towards the bull and the bull charged him and knocked him down. Luckily, the bull got distracted and continued to run ahead leaving the runner sprawled on the ground. The pack entered the bullring all in a row, with one bull leading the way and the bell-oxen continuing to stay close to the bulls and this fact kept them from getting distracted so that it was relatively easy to lead all the bulls quickly across the arena and soon all of the Dolores Aguirre bull-breed were safely in the pens.